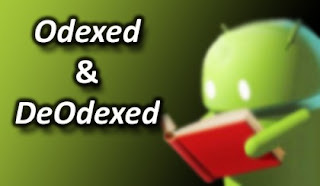 Well , since most customization for custom roms require a deodex device , lets first understand the fundamental of the file naming system in android devices. Below is the understanding of the odex and deodex file. Well some of us wanted to use stock rom but to have the ability to customized it with theme and a few other mods. So here a fundamental of it and how to deodex your system. In summary, Deodexed ROMs (or APKs) have all their application packages put back together in one place, allowing for easy modification such as theming. Since no pieces of code are coming from any external location, custom ROMs or APKs are always deodexed to ensure integrity. For the more geeky amongst us, Android OS uses a Java-based virtual machine for running applications, called the Dalvik Virtual Machine. A deodexed, or .dex file contains the cache used by this virtual machine (referred to as Dalvik-cache) for a program, and it is stored inside the APK. An .odex file, on the other hand, is an optimized version of this same .dex file that is stored next to the APK as opposed to inside it. Android applies this technique by default to all the system applications. Now, when an Android-based system is booting, the davlik cache for the Davlik VM is built using these .odex files, allowing the OS to learn in advance what applications will be loaded, and thus speeds up the booting process. For a casual user, the main implication is in theming possibilities. Themes for android come in APKs too, and if you want to modify any of those, you should always choose a dedoexed custom ROM. 3.If everything goes well xUltimate should recognize the phone and make a connection.You now should see a list of options. 4.Select option (1) pull /system/app. Wait until it complete. 5.Select option (2)pull /system/framework. Wait until it complete. 6.Then select option (3) Deodex /system/app. Wait until it complete. 7.Then select option (4)Deodex /system/framework. Wait until it complete. 9.Put the phone in USB mass storage. 10.Go to xUltimate folder and copy "done_frame", and "done_app", and move them to the root of the sdcard. 11.Now get out from USB storage mode. ( Goto folder where android sdk installed. Then goto platform-tools folder in it. Right click on free space in folder while pressing shift key.Select open command prompt here. 14.Now you have deodexed rom. Then select option (3) Deodex /system/app. Wait until it complete.